Because I’m a programmer, I’m going to focus on what it takes in the code to make melee weapons happen. I’m not going to spend any time on creating 3D models or animations or particle effects because there are many other tutorials out there that cover those topics and they’re really beyond the scope of what I’m trying to show. I will, however, go over how to use these things in the editor and how to access them through your code. I’ve also provided all the content I’m using in this tutorial (as well as the source code) here, so you don’t have to make it all from scratch just to see the tutorial. I’m also going to assume that you have a basic understanding of Unrealscript and the UDK editor, because if I had to explain every little thing I was talking about, this would be a ten part instead of a three part series. In part one, I’ll explain how to set up your programming environment using Mavrik Games' very own Project Suite Management Utility and Pixel Mine’s nFringe. I’ll go over setting up the pawn, player controller, weapon, game info and inventory manager classes. I’ll show you how to set up an isometric camera and give the sword to the pawn when the game starts. So, without further ado, let’s get started. To set up the project, I recommend using Pixel Mine’s nFringe plugin for Visual Studio and my own home-grown application the Project Suite Management Utility. If you’re never used those tools before and you don’t want to, you can still follow this tutorial as long as you know how to set up your environment. I’m going to go through this tutorial assuming you’re using them though. The Project Suite Management Utility takes care of all the required setup by creating a Visual Studio solution for your suite and a Visual Studio project for your game, as well as setting up the configuration files and content directories. If this is the first time you’re running the PSMU, it will ask you to select the root directory of your UDK installation. Once you’ve selected the folder, create a project suite. You can call it whatever you want, but mine is called “Tutorial”. Add a game to the suite (mine’s called MeleeWeapon) and select it in the list. Leave the settings at default and click the execute button. I’m going to set up the game to use a third person, free-moving isometric camera like Legend of Zelda: Twilight Princess or Batman: Arkham Asylum. To do this, I need to set up a skeletal mesh for the pawn to use. There are a couple of different ways of doing this, but I like using archetypes because it allows the level designers to change the parameters they need using the editor rather than bugging us programmers to do it in code. I also like them because I can use the editor to adjust the parameters rather than needing to re-compile and re-launch the application to see the changes. So in the MeleeWeaponGameInfo.uc class, we need a variable to set the pawn’s archetype. We’ll assign that along with the player controller class in the DefaultProperties section. Note: if you're using an older version of the PSMU or if you've just downloaded the code, the last line will need to be PlayerControllerClass=class'MeleeWeapon.MeleeWeaponPlayerController'. 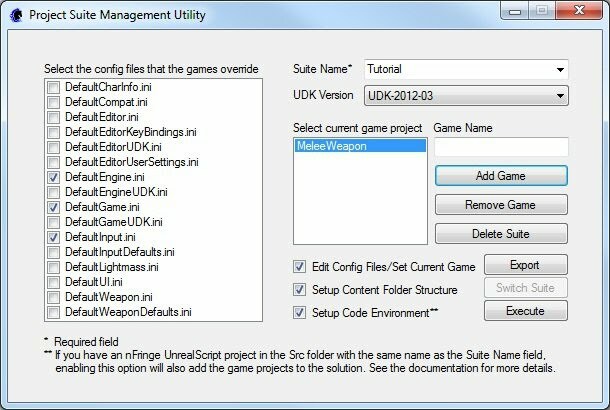 The latest version of the PSMU appends the word "Game" to the end of the package names to conform to the naming standard in the Unreal Engine. The SpawnDefaultPawnFor function gets called when the player controller class is initialized. Basically all that needs to happen is we need to return a pawn spawned according to the PawnArchetype and the game engine takes care of assigning the controller to it. The IsoCamAngle will be used to clamp the CamPitch, which is just the pitch component of the camera rotation. CamOffsetDistance is the distance from the camera to the player and the SwordHandSocketName will be assigned the name of the socket located on the pawn’s skeletal mesh where we want the sword to attach (the “WeaponPoint” socket on the human-like skeletal meshes that come with UDK). We set up everything but the CamPitch to be visible to the editor by adding “()” after the “var” declaration. Note that if we write something in between the parentheses for a variable, that variable would show up under a section with that same title in the properties window in the editor. By default though, these variables will just show up under a section with the same name as the class – in this case, “Melee Weapon Pawn”. The CamPitch will be set within code and adjusted every tick, so it doesn’t need to be visible to the editor. Next, let’s set up the DefaultProperties section. I won’t go into too much detail about what’s going on here except to say that this is where we attach the light environment and skeletal mesh to the pawn. We don’t actually tell it which skeletal mesh to use though – we’ll set that up in the archetype. Think of the DefaultProperties section as the constructor – whenever an Actor gets spawned or an Object gets instantiated, it gets built by assigning its variables according to this section. First of all, we move the camera to the player’s location to make that the center of our coordinate system. We use something similar to the formula to calculate a point on a sphere, but we invert it because of all the aforementioned reasons. Also, we use the UnrRotToRad constant to convert our rotation units to radians. The player’s yaw is our theta, the CamPitch our phi, the CamOffsetDistance our radius and viola! The camera is translated to the right point on the sphere around our player. We set the yaw and the pitch on the camera to point it at our player and we set the roll to zero so it always stays upright. The last thing we do is check to make sure that our camera hasn’t bumped into any walls by raytracing from the player’s location to the camera’s. If it hits a wall, we just move it to where the collision took place, padded by a sphere with a 12 unit radius so we don’t see through the wall. The next step is to adjust the CamPitch when the user moves the mouse up and down. I like to keep all my input handling in the player controller class, so open up MeleeWeaponPlayerController.uc. We just want to tap into the UpdateRotation method to adjust our pawn’s CamPitch variable. We also want to constrain CamPitch so we can’t go around and around the player in vertical circles. We’ll use the IsoCamAngle to clamp it. I’ll mention again that we’re only attaching the skeletal mesh component to the sword, we’ll pick the actual mesh in the editor and assign it to our archetype. Now we need to be able to give the sword to our player. To do this, we need to write our own Inventory Manager class that extends InventoryManager so that we can spawn the weapon based off of our archetype. Really the only difference between this function and the CreateInventory function in the InventoryManager class is the last parameter to the Spawn function, which is the template from which to build the weapon. We also set the first item in the PendingFire array to “0″ in the DefaultProperties, meaning that this weapon is not waiting to fire. We’ll go into more detail when we get ready to start swinging the sword. That’s it for part one. In part two, I’ll talk about how weapons work in UDK and how we’re going to manipulate that system for our melee weapon. I’ll go into more detail about how archetypes work and show you how to use them in the editor. We’ll add meshes to our sword and pawn, and build a simple world with some objects in it to test out our sword. Finally, I’ll show you how to actually swing the sword and apply momentum and damage to whatever it hits.